120 The Best boutiques are right here in your own backyard! Pamper yourself with Jewelry, Fashions & Shoes, and decorate your home with unique Home Décor! HIGHWAY 28: Thorhild - Nook in the Woods page 39; Waskatenau - HJC’s Retail page 42; St. Paul - Modern Mix page 52, St. Brides Trading Post page 50, Simplistic Gifts page 52; Cold Lake - The Finishing Touch page 62. 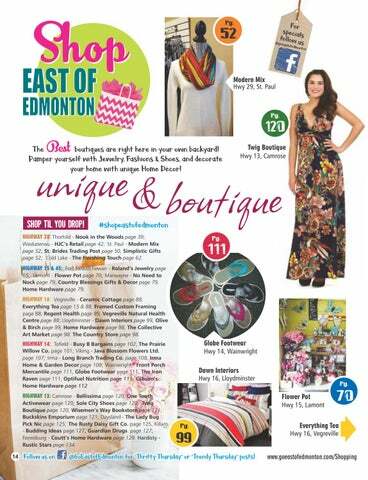 HIGHWAY 15 & 45: Fort Saskatchewan - Roland’s Jewelry page 65; Lamont - Flower Pot page 70; Marwayne - No Need to Nock page 79, Country Blessings Gifts & Decor page 79, Home Hardware page 79. HIGHWAY 16: Vegreville - Ceramic Cottage page 88, Everything Tea page 15 & 88, Framed Custom Framing page 88; Regent Health page 89, Vegreville Natural Health Centre page 88; Lloydminster - Dawn Interiors page 99, Olive & Birch page 99, Home Hardware page 98, The Collective Art Market page 98. The Country Store page 98. Flower Pot Hwy 15, Lamont Pg. @GoEastofEdmonton for “Thrifty Thursday” or “Trendy Thursday” posts!